1دانشجوی دکتری زراعت، انجمن پژوهشگران جوان، دانشکده کشاورزی، دانشگاه شهید باهنر کرمان. 2دانشیار زراعت، دانشکده کشاورزی، دانشگاه شهید باهنر کرمان. ظهور جوانه زعفران به فشردگی و ساختمان خاک حساس است. جرم مخصوص ظاهری خاک به عنوان مهم­ترین شاخص کیفیت فیزیکی خاک معرفی می­شود. بر این اساس این آزمایش با هدف بررسی اثر کاربرد کمپوست و کمپوست-بیوچار در بستر کاشت بر میزان ظهور و رشد اولیه گیاهچه اکوتیپ­های زعفران و ارتباط آن با جرم مخصوص ظاهری خاک انجام شد. تیمارهای آزمایش شامل بسترهای کاشت (بدون افزودن ماده آلی (شاهد)، اختلاط 20 تن کمپوست در هکتار و اختلاط 10 تن کمپوست+ 8 تن بیوچار (مواد سلولزی درختان جنگلی) در هکتار) و اکوتیپ­های مختلف زعفران (بجستان، استهبان، فردوس، گناباد، نطنز، قائن، سرایان، تربت حیدریه و زرند) بودند. داده­های حاصل از آزمایش در قالب طرح بلوک­های کامل تصادفی بین بسترهای کشت مورد تجزیه مرکب قرار گرفت. نتایج نشان داد کاربرد کمپوست و کمپوست-بیوچار، پارامترهای ظهور جوانه اصلی و جوانه­های فرعی و همچنین پارامترهای رشد برگ را نسبت به شاهد بهبود داد. در بین اکوتیپ­ها زرند، تربت حیدریه و استهبان نسبت به سایر اکوتیپ­ها پاسخ متفاوتی از نظر درصد و سرعت ظهور جوانه اصلی به نوع بستر کاشت نشان دادند. تنوع قابل توجهی در بین اکوتیپ­ها از نظر تمام پارامترهای مورد مطالعه مشاهده شد که بیانگر سازگاری اکوتیپ­ها به شرایط اقلیمی منشأ بنه بود. به­طور کلی اکوتیپ­های بجستان، فردوس و قائن از نظر سطح و وزن خشک برگ برتری نشان دادند. کمپوست و کمپوست-بیوچار به­طور معنی­داری (12 درصد) موجب کاهش جرم مخصوص ظاهری خاک نسبت به شاهد شدند. تجزیه رگرسیون خطی نشان داد بین جرم مخصوص ظاهری و پارامترهای مورد بررسی ارتباط منفی وجود داشت و کاهش معنی­داری در تمام پارامترهای مورد بررسی با افزایش جرم مخصوص ظاهری مشاهده شد. Emergence of saffron buds is sensitive to soil compaction and structure. Soil bulk density is introduced as the most important index of soil physical quality. Accordingly, this study was done to evaluate the effect of compost and compost-biochar in planting bed on the emergence and early seedling growth of saffron ecotypes and its relationship to soil bulk density. Experimental treatments consisted of planting beds (without any organic amendment (control), incorporation of 20 t.ha-1 compost and 10 t.ha-1 compost+ 8 t.ha-1 biochar (cellulosic material of hardwood)) and different ecotypes of saffron (Bajestan, Estahban, Ferdows, Gonabad, Natanz, Qaen, Sarayan, Torbate-Heydarieh and Zarand). Data obtained from experiment were subjected to combined analysis of variance among planting beds based on randomized complete block design. The results showed that application of compost and compost+biochar, improved emergence of the main and lateral buds as well as leaf growth parameters compared to the control. Zarand, Torbate-Heydarieh and Estahban ecotypes responded differently to the planting bed types in terms of emergence percent and rate of main bud compared to other ecotypes. Considerable variation was observed among the ecotypes in terms of all studied parameters, which indicated the adaptability of ecotypes to climatic conditions of corm provenance. Generally, the Bajestan, Ferdows and Qaen ecotypes showed superiority in terms of leaf area and dry weight. Compost and compost-biochar significantly (12%) reduced the soil bulk density compared to the control. Linear regression analysis indicated that there was a negative relationship between soil bulk density and the studied parameters, and significant decrease in all parameters was observed with increasing of soil bulk density. Agegnehu, G., Bass, A.M., Nelson, P.N., Muirhead, B., Wright, G., and Bird, M.I. 2015. Biochar and biochar-compost as soil amendments: Effects on peanut yield, soil properties and greenhouse gas emissions in tropical North Queensland, Australia. Agriculture, Ecosystems and Environment 213: 72-85. Amlinger, F., Peyr, S., Geszti, J., Dreher, P., Karlheinz, W., and Nortcliff, S. 2007. Beneficial effects of compost application on fertility and productivity of soils. Literature Study, Federal Ministry for Agriculture and Forestry. Environment and Water Management, Austria, Retrieved from: www.umweltnet.at/filemanager/download/20558/. Behdani, M.A., and Fallahi, H.R. 2015. 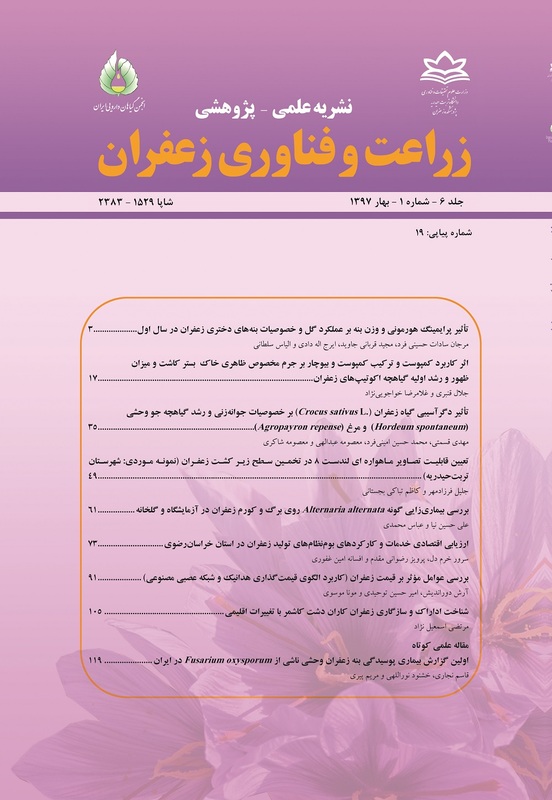 Saffron: Technical knowledge based on research approaches, University of Birjand Press. 411 p. (In Persian). Bushman, B.S., Johnson, D.A., Connors, K.J., and Jones, T.A. 2015. Germination and seedling emergence of three semiarid Western North American legumes. Rangeland Ecology and Management 68 (6): 501-506. Case, S.D.C., McNamara, N.P., Reay, D.S., and Whitaker, J. 2012.The effect of biochar addition on N2O and CO2 emissions from a sandy loam soil the role of soil aeration. Soil Biology and Biochemistry 51: 125-134. Celik, I., Gunal, H., Budak, M., and Akpinar, C. 2010. Effects of long-term organic and mineral fertilizers on bulk density and penetration resistance in semi-arid Mediterranean soil conditions. Geoderma 160: 236-243. Czyz, E.A. 2004. Effects of traffic on soil aeration, bulk density and growth of spring barley. Soil and Tillage Research 79: 153-166. Dam, R.F., Mehdi, B.B., Burgess, M.S.E., Madramootoo, C.A., Mehuys, G.R., and Callum, I.R. 2005. Soil bulk density and crop yield under eleven consecutive years of corn with different tillage and residue practices in a sandy loam soil in central Canada. Soil and Tillage Research 84: 41-53.
daSilva, A.P., and Kay, B.D. 1996. The sensitivity of shoot growth of corn to the least limiting water range of soils. Plant and Soil 184: 323-329.
deJuan, J.A., Corcoles, H.L., Muñoz, R.M., and Picornell, M.R. 2009. Yield and yield components of saffron under different cropping systems. Industrial Crops and Products 30: 212-219. Estefan, G., Sommer, R., and Ryan, J. 2013. Methods of Soil, Plant, and Water Analysis: A manual for the West Asia and North Africa region. 3rdeds. Copyright © ICARDA (International Center for Agricultural Research in the Dry Areas) Box 114/5055, Beirut, Lebanon. 244 pp. Fischer, D., and Glaser, B. 2012. Synergisms between compost and biochar for sustainable soil amelioration. In S.E. Kumar (eds). Management of Organic Waste. In Tech., Shanghai, China. p. 167-198. Ghafourian, H. 2016. Nano-Biochar, Biochar, Charcoal and Coal Based Biochar, Design of Pyrolysis Reactors Production Methods and Application. Amazon Kindle, 1st Edition, 116 pp. Gresta, F., Lombardo, G.M., Siracusa, L., and Ruberto, G. 2008. Saffron, an alternative crop for sustainable agricultural systems. A review. Agronomy for Sustainable Development 28: 95-112. Guo, L., Wu, G., Li, Y., Li, C., Liu, W., Meng, J., Liu, H., Yu, X., and Jiang, G. 2016. Effects of cattle manure compost combined with chemical fertilizer on topsoil organic matter, bulk density and earthworm activity in a wheat-maize rotation system in Eastern China. Soil and Tillage Research 156: 140-147. Khorramdel, S., Eskandari Nasrabadi, S., and Mahmoodi, G. 2015. Evaluation of mother corm weights and foliar fertilizer levels on saffron (Crocus sativus L.) growth and yield components. Journal of Applied Research on Medicinal and Aromatic Plants 2: 9-14. Koocheki, A., and Seyyedi, S.M. 2015. Relationship between nitrogen and phosphorus use efficiency in saffron (Crocus sativus L.) as affected by mother corm size and fertilization. Industrial Crops and Products 71: 128-137. Kucera, B., Cohn, M.A., and Leubner-Metzger, G. 2005. Plant hormone interactions during seed dormancy release and germination. Seed Science Research 15: 281-307. Latif, N., Khan, M.A., and Ali, T. 2008. Effects of soil compaction caused by tillage and seed covering techniques on soil physical properties and performance of wheat crop. Soil and Environment 27: 185-192. Lazcano, C., Sampedro, L., Zas, R., and Domínguez, J. 2010. Vermicompost enhances germination of the maritime pine (Pinus pinaster Ait.). New Forests 39: 387-400. Lehmann, J., and Joseph, S. 2009. Biochar for environmental management: an introduction. In J. Lehmann and S. Joseph (eds). Biochar for Environmental Management: Science and Technology. Earthscan, London, p. 1-12. Maguire, J.D. 1962. Speed of germination—aid in selection and evaluation for seedling 458 emergence and vigor. Crop Science 2: 176-177. Melnyk, J.P., Wang, S., and Marcone, M.F. 2010. Chemical and biological properties of the world's most expensive spice: Saffron. Food Research International 43: 1981-1989. Mukherjee, A., Lal, R., and Zimmerman, A.R. 2014. Effects of biochar and other amendments on the physical properties and greenhouse gas emissions of an artificially degraded soil. Science of the Total Environment 487: 26-36. Orchard, T.J. 1977. Estimating the parameters of plant seedling emergence. Seed Science and Technology 5: 61-69. Renau-Morata, B., Nebauer, S.G., Sanchez, M., and Molina, R.V. 2012. Effect of corm size: water stress and cultivation conditions on photosynthesis and biomass partitioning during the vegetative growth of saffron (Crocus sativus L.). Industrial Crops and Products 39: 40-46. Sadras, V.C., O'Leary, G.J., and Roget, D.K. 2005. Crop responses to compacted soil: capture and efficiency in the use of water and radiation. Field Crops Research 91: 131-148. Soane, B.D., and Van Ouweerkerk, C. 1995. Implications of soil compaction in crop production for quality of the environment. Soil and Tillage Research 35: 5-22. Sohi, S., Krull, E., Lopez-Capel, E., and Bol, R. 2010. A review of biochar and its use and function in soil. Advances in Agronomy 105: 47-82. Solaiman, Z.M., Murphy, D.V., and Abbott, L.K. 2012. Biochars influence seed germination and early growth of seedlings. Plant and Soil 353: 273-287. Tammeorg, P., Simojoki, A., Makela, P., Stoddard, F.L., Alakukku, L., and Helenius, J. 2014. Short-term effects of biochar on soil properties and wheat yield formation with meat bone meal and inorganic fertiliser on a boreal loamy sand. Agriculture, Ecosystems and Environment 191: 108-116. Van Zwieten, L., Kimber, S., Morris, S., Chan, K.Y., Downie, A., Rust, J., Joseph, S., and Cowie, A. 2010. Effects of biochar from slow pyrolysis of papermill waste on agronomic performance and soil fertility. Plant and Soil 27: 235-246. Wilson, M.G., Sasal, M.C., and Caviglia, O.P. 2013. Critical bulk density for a Mollisol and a Vertisol using least limiting water range: Effect on early wheat growth. Geoderma 192: 354-361. Zhang, A.F., Cui, L.Q., Pan, G.X., Li, L.Q., Hussain, Q., Zhang, X.H., Zheng, J.F., and Rowley, D. 2010. Effect of biochar amendment on yield and methane and nitrous oxideemissions from a rice paddy from Tai Lake plain China. Agriculture, Ecosystems and Environment 139: 469-475.